A new cosmic map is giving scientists an unprecedented look at the boundaries for the giant supercluster that is home to Earth's own Milky Way galaxy and many others. Scientists even have a name for the colossal galactic group: Laniakea, Hawaiian for "immeasurable heaven." "We live in something called 'the cosmic web,' where galaxies are connected in tendrils separated by giant voids," said lead study author Brent Tully, an astronomer at the University of Hawaii at Honolulu. 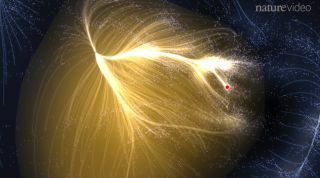 This computer-generated depiction of the Laniakea Supercluster of galaxies, which includes the Milky Way galaxy containing Earth's solar system, shows a view of the supercluster as seen from the supergalactic equatorial plane. Galaxies are not spread randomly throughout the universe. Instead, they clump in groups, such as the one Earth is in, the Local Group, which contains dozens of galaxies. In turn, these groups are part of massive clusters made up of hundreds of galaxies, all interconnected in a web of filaments in which galaxies are strung like pearls. The colossalstructures known as superclusters form at the intersections of filaments. "We have a new way of defining large-scale structures from the velocities of galaxies rather than just looking at their distribution in the sky," Tully said. Two views of the Laniakea Supercluster, a massive collection of galaxies that contains Earth's Milky Way galaxy and many others, are shown in these computer-generated images. The name Laniakea was suggested by Nawa'a Napoleon, who teaches Hawaiian language at Kapiolani Community College in Hawaii. The name is meant to honor Polynesian navigators who used their knowledge of the heavens to make long voyages across the immensity of the Pacific Ocean. "We live in the Local Group, which is part of the Local Sheet next to the Local Void — we wanted to come up with something a little more exciting than 'Local,'" Tully told Space.com. "We probably need to measure to another factor of three in distance to explain our local motion," Tully said. "We might find that we have to come up with another name for something larger than we're a part of — we're entertaining that as a real possibility."